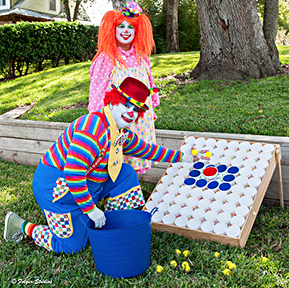 < Shrine Braz Clowns Chilly Willy and Cupcake collect game balls at Louie and Chinna Yaklin’s dock during the Regatta. Also two thumbs up for all the volunteers, sponsors & participants. Super-duper Regatta this year!! !